Lesson planning is part of the weekly routine here in the Thorpe household. Before the start of each new week, I sit in a comfortable place, sift through a stack of student textbooks, flip through teachers’ guides, and jot down multicolored notes in composition notebooks. 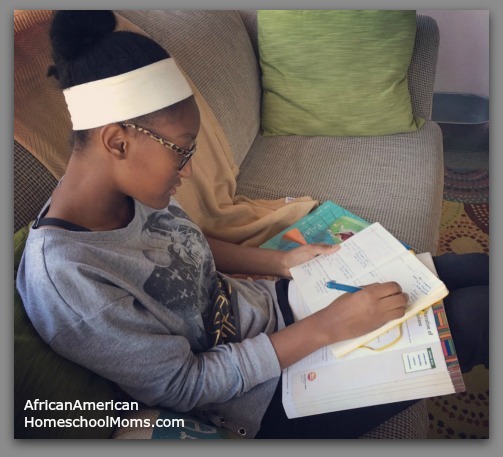 My planning routine has been going on for years, but as my children have gotten older, I’ve shifted some of the planning duties to them. Once my girls entered middle school, I required them to join me as I planned the week’s lessons. I wanted them to begin taking more responsibility for their assignments, to see how much time and effort went into planning, and to understand my lesson planning process. These joint Weekly Planning Meetings have given the girls much insight into lesson planning and have helped me make the planning process more productive and more efficient. Weekly meetings give us time to talk about how school is going. As we plan together, the girls and I have time to chat about what did and did not work well during the previous week. Was there enough time to complete the science experiments? Did we plan enough time to finish the assigned amount of reading? Can we move a bit faster in math or do we need to slow down? As we plan together, we can adjust the lesson plans to suit each girl’s needs. Weekly meetings foster independence. When it’s time to school, the girls open their planners and begin to work, often without much input from me. Because we’ve planned together, they know exactly what to do and can often begin to work on lessons independently. Weekly meetings foster encourage flexibility. I’m teaching three separate grades, so my girls need to be both flexible and patient. If I’m teaching a lesson to my first grader, my older daughters can easily switch gears and work on another subject while they wait for me to finish teaching their younger sister. Weekly planning meetings reduce the number of questions I receive. Throughout the week, I answer fewer planning related questions. What do I do next? What books do I need? How much should I read? These are no longer questions that need to be answered because they’re always addressed during our weekly planning meeting. I have the girls use a two page spread that provides them with ample writing space and allows them to see the entire school week at a glance. If necessary, they use a ruler to divide the pages into six equally sized sections. The first five sections are labeled Monday, Tuesday, Wednesday, Thursday, and Friday. The sixth and final section is labeled Notes. Once sections are labeled, the girls go back and date each section. Next, the girls open their books and use them to write out plans by subject. As we review each subject, the girls fill in assignments for each school day, including page and/or lesson numbers when necessary. The Notes section is optional, but it provides a space for the girls to record any other details that affect their week. This includes instrumental lessons, soccer practices, church youth group meet-ups, medical appointments, etc. As the girls plan in their journals, I also write the plans inside my bullet journal. If the girls misplace their planning journals, I still have record of their weekly assignments. Make time to plan. Set a predetermined day and time and stick to it. Make planning part of your weekly routine, but choose a day and time that will work for you and your child. Start slowly. In the beginning things will likely move slowly as you get used to this new routine. As you hold more meetings, planning will be completed in a shorter amount of time. Allow plenty of time. Don’t rush through the planning routine. This meeting often sets the tone for the school week, so make sure you take time to ask and answer questions. Discuss plans fully so everyone knows what to do. Make it fun. Break out the special planning tools. 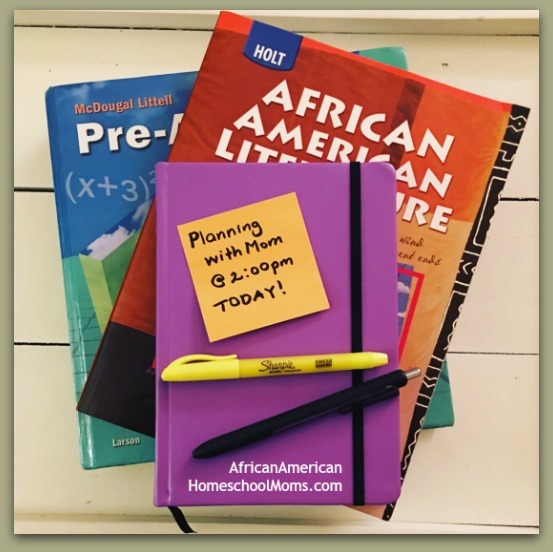 Allow your child to choose their own planning journals and writing utensils. We love colorful Leuchtturm 1917 journals and we swoon over Ink Joy Gel Pens! Pick out a comfortable meeting place. Planning takes time and space, so you’ll want to select a work space that has plenty of room for all of your materials and features comfortable seating. Our favorite place to plan is in our sunroom because we love the room’s natural light and comfy couches. My girls and I have found Weekly Planning Meetings to be an effective way to help keep our homeschool running smoothly. For more tips on lesson planning, check out these additional posts: Creating Lesson Plans Using Evernote and Tips For Creating Weekly Lesson Plans. I love this concept and I need to begin to implement it on some level with my 10 and almost 12 year old boys. I’m glad this post has piqued your interest. My girls are about the same age as your boys and the Weekly Planning Meeting has worked well for us. l hope you find it useful as well. Thank you for taking time to comment. this is amazing!!! LOVE IT!! !